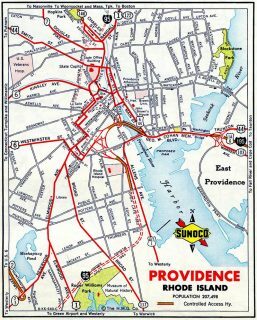 Interstate 195 serves regional traffic demands, joining Providence, Rhode Island and the I-95 corridor with Fall River, New Bedford and Cape Cod in southeast Massachusetts. With auxiliary lanes, the nearly 45 mile long route accommodates as many as ten lanes. Starting in Downtown Providence across the Iway Bridge over Providence Harbor, I-195 travels to East Providence, Rhode Island and suburban areas of Seekonk and Swansea, Massachusetts. East from there, I-195 crosses the Taunton River on the Braga Bridge to the city of Fall River, where the freeway passes below the Fall River Government Center through a cut and cover tunnel. 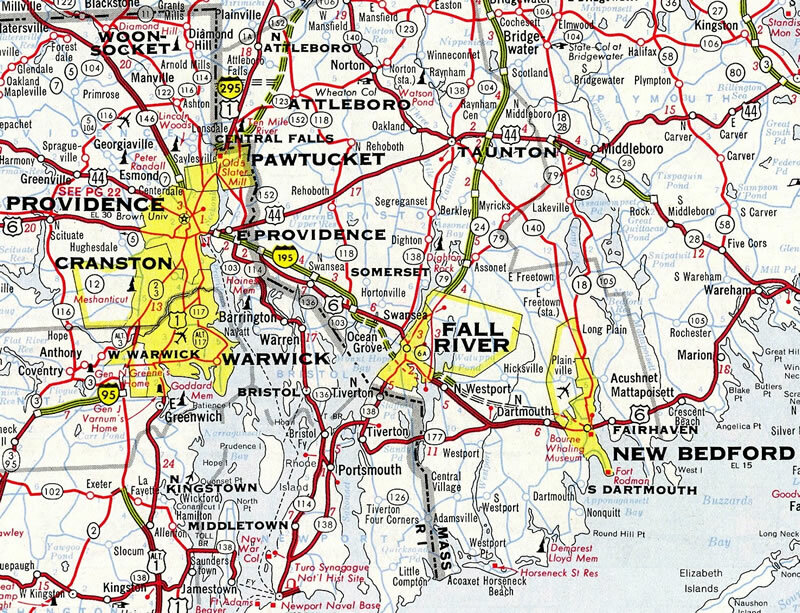 Route 24 also overlaps with I-195 between separate freeways leading south to Tiverton, R.I. and north to Taunton, Mass. 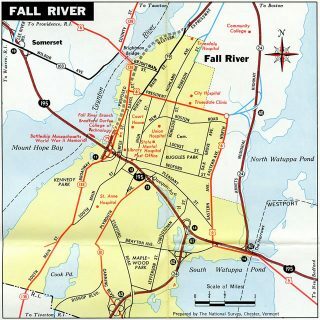 Continuing east from Fall River, Interstate 195 parallels U.S. 6 through rural sections of Westport and Dartmouth with six overall lanes. The freeway narrows to four lanes across the city of New Bedford, where it spans the Acushnet River along a short causeway. Curving northeast, I-195 heads through Fairhaven, Mattapoisett and Marion to its junction with Interstate 495 and Route 25 in Wareham. Massachusetts 25 extends the Interstate 495 freeway east from I-195 to Buzzards Bay, U.S. 6 and the Bourne Bridge to Cape Cod. The Bourne Bridge provides one of two spans across Cape Cod Canal, with U.S. 6 east over the Sagamore Bridge being the other. 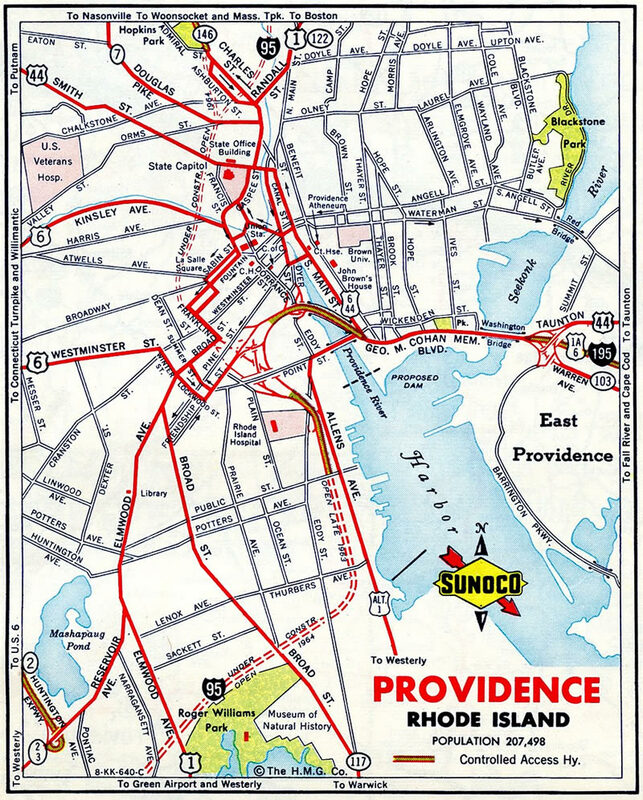 Interstate 195 completed from Providence to U.S. 6 and Route 118 in 1963. Massachusetts previously continued the sequential exit numbering system for Interstate 195 started in Rhode Island. Exits 10, 11 and 12 here are now Exits 4, 5 and 6. The second to last exit on Interstate 195 is for Exit 21 to Route 28 and Wareham. Route 28 provides a cutoff from I-195 to Route 25 at Exit 22A. Photo taken by Douglas Kerr (04/20/02). Interstate 195 eastbound concludes as traffic separates at Exits 22A/B. Route 25 extends southeast along a freeway to East Wareham, Indian Beach and Buzzards Bay. I-495 leads northwest toward Middleborough. Photo taken by Douglas Kerr (04/20/02). Massachusetts 25 winds west from U.S. 6 at Buzzards Bay as a 10.04 mile route to Interstates 195 west and 495 north. Photo taken by H.B. Elkins (05/31/13). Massachusetts 25 takes a long straight away from a causeway over Mill Pond to the trumpet interchange (Exit 1) with I-195 west to New Bedford and I-495 north to Middleborough. Photo taken by H.B. Elkins (05/31/13). Crossing the Wankinco River, traffic separates at the west end of Route 25, with Interstates 195 and 495 diverging toward Providence and Worcester. Photo taken by H.B. Elkins (05/31/13). A vintage ground level sign directed motorists onto Interstate 195 west from Massachusetts 25 west at Exit 1. Photo taken by Douglas Kerr (04/20/02). See the Interstate 495 guide for photos covering the joint south end of I-495 and east end of Interstate 195. Interstate 195 & U.S. 6 west cross the eight-lane Iway Bridge over the Providence River just ahead of their separation at Interstate 95. Three lanes join I-95 leading south to T.F. Green Airport (PVD), New London, Connecticut and New York. Photo taken 10/06/14. Construction from 2005 to 2010 associated with the Iway Project added high speed flyovers linking Interstates 95 and 195. The previous exchange included left-hand ramps. U.S. 6 west merges onto I-95 north to the Memorial Drive interchange while Exit 1B departs from the southbound on-ramp for Eddy Street and Rhode Island Hospital. Photo taken 10/06/14. Construction started in 2014 for the Providence Viaduct replacement project rebuilt the southbound lanes of Interstate 95 to the exchange with U.S. 6 west and Memorial Boulevard east. New signs were installed along this stretch in 2015, including a side mounted sign for I-195 east ahead of the Smith Street overpass. Photo taken by H.B. Elkins (05/31/13). U.S. 6 east combines with Interstate 95 south from the Huntington Expressway for a short overlap to Interstate 195 east (Exit 20). Photo taken by H.B. Elkins (05/31/13). A lane drop occurs at forthcoming Exit 20 for Interstate 195 & U.S. 6 east. The two routes cross the Iway Bridge to India Point Park, and the Washington Bridge over the Seekonk River into East Providence. Photo taken by H.B. Elkins (05/31/13). Staying below grade, Interstate 95 & U.S. 6 curve southeast to their split at I-195 (Exit 20) below the Broad Street overpass. Photo taken by H.B. Elkins (05/31/13). An older diagrammatic sign posted at the Atwells Avenue overpass preceded the short overlap of U.S. 6 east between the Huntington Expressway west and the former alignment of I-195 east. Photo taken 06/26/05. A button copy overhead at the Broad Street overpass outlined the original left-hand ramp (Exit 20) for Interstate 195 & U.S. 6 east. Photo taken 06/26/05. Interstate 95 advances north with four lanes along industrial areas beside Providence Harbor to the three-wye interchange (Exit 19) with Interstate 195 & U.S. 6 east. Photo taken by Ian Ligget (07/03/10). The steel arches of the Iway Bridge come into view as Exit 19 separates from the Interstate 95 northbound mainline for I-195 & U.S. 6 to East Providence, Fall River, New Bedford and Cape Cod, Massachusetts. Photo taken by Ian Ligget (07/03/10). The old exit for Interstate 195 & U.S. 6 east was located 0.6 miles further north. It was numbered as Exit 20. Photo taken 06/26/05. 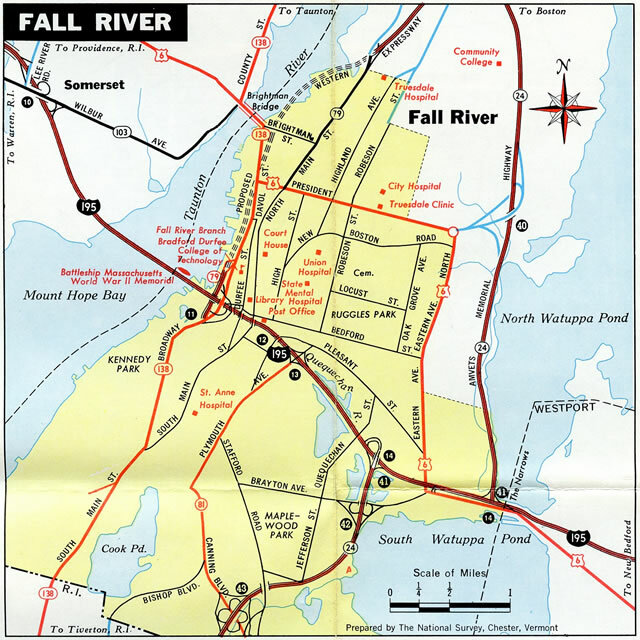 The former alignment of Interstate 195 circled around the Jewelry District from I-95 along side Friendship Street to span the Providence River by James Street. The freeway curved south between the couplet of Main and Water Streets and east to the Washington Bridge. Photo taken by Douglas Kerr (09/28/01). East Providence Expressway (I-195). BostonRoads.com. IWAY — Steere Engineering Inc.
Iway (I-195 Relocation Project) – FHWA Center for Innovative Finance Support: Project Profiles. Page updated August 4, 2017.